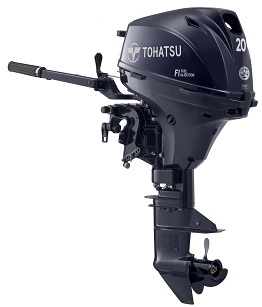 Tohatsu’s MFS 50/40, at just 209 pounds, is the lightest weight motor in its class. The 50/40 four stroke is also equipped with an improved gear case with lower gear ratio, giving you the increased low end torque your boat needs. Tohatsu’s all-new MFS 20/15/9.9 portable models are the world’s lightest battery-less electronic fuel injection four-strokes in each of their horsepower classes. Typically, cutting the weight down results in losing power, however, it isn’t the case for Tohatsu with the exceptional torque and top end speed, paired with low noise, low vibration, and ease of use. Go get one and let's feel the wind. Thanks to Tohatsu’s 5hp Liquefied Petroleum Gas (LPG) outboard, sailors are no longer forced to carry gasoline on board. The 5hp LPG comes equipped with a fuel line that will connect to any standard North American propane tank. Our innovative LPG outboard will run for a full 5 hours at WOT on a single 11lb propane tank, without sacrificing performance. 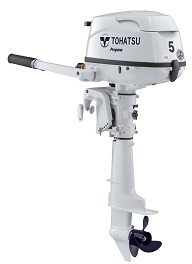 Exclusive to Tohatsu’s LPG outboard is the Safety Fuel Shut Off Valve which keeps propane fuel from continuously running when engine is not in use. Plus, since the 5hp LPG does not require ethanol gas, this propane outboard requires almost zero maintenance on fuel related components. We offer a 20” and 25” shaft Sail Pro model which includes a 12V 60W 5A charging system and high thrust prop. What sailor doesn’t want a virtually maintenance free engine that Backs You Up ™ ? 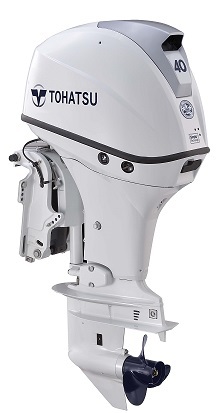 Here at Megrew´s Boats we stock a large supply of Tohatsu Outboards and parts for the Tohatsu community.